Before I share my thoughts, I want to mention something that Ariana Grande said during the Behind the Scenes special. She said that the ratings of live television musicals prove that people are enjoying the format and craving it. I can’t even describe the level of excitement I feel seeing musicals back in the spotlight. The live format is risky yet thrilling to watch; it is the touch of art and culture that more people need in their lives. 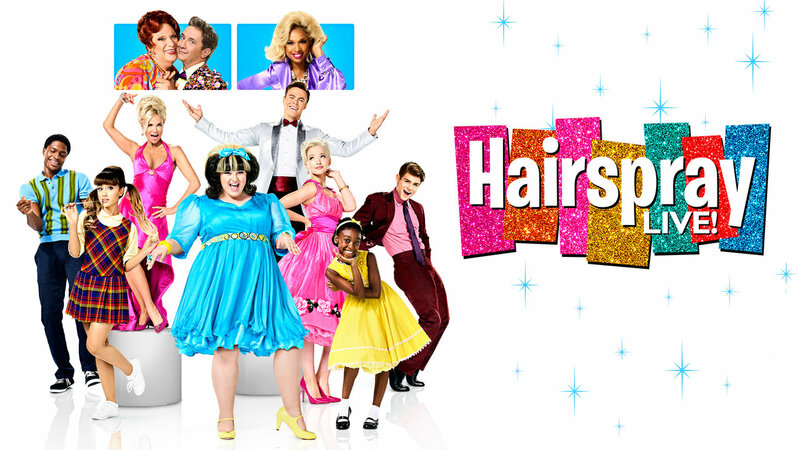 In regard to the review, it will be a little more casual than my Grease: Live blog post. I’m going to write down my notes as I thought them prior to each scene. On with the show! 1st Scene | Good Morning Baltimore: Maddie Baillio was born to play this part with her beautiful voice and cheerful disposition. I saw some nerves in the beginning. Her movements seemed a bit awkward, and it was obvious that she was having trouble singing while dancing. But, this is her first musical job ever so I have no doubt she will be just fine once she settles in. I loved the bed to street transition. I had no idea Maddie was standing. I actually marveled at how good she sounded singing whilst laying down. Very creative and cool! 2nd Scene | The Nicest Kids in Town: The colorful sets and costumes scream Hairspray. Derek Hough is perfect as Corny Collins with his television announcer voice and smooth dance moves. I thought his “guys and Gidgets” comment was a cute 60s detail. Looking at Garrett Clayton makes me feel like I’m seeing the ghost of a certain 2007 Link Larkin. He and Zac could be twins! Edna Turnblad and Penny Pingleton made an impression with funny dialogue in this scene. Dove Cameron is nailing the annoying qualities of Amber Von Tussle’s personality. What can I say about Kristin Chenoweth? She is the QUEEN!! 3rd Scene | Mama, I’m a Big Girl Now: This is going to shock some people, but I find Harvey’s raspy voice to be a bit much, even for Edna. Martin Short was a smart casting choice for Wilbur Turnblad; I couldn’t possibly love him more. The mothers and daughters duet was great. The bedroom sets had so much individual personality, and the interactions were highly entertaining. Dove is impressing me with her vocals. I knew she could sing but not like this! 4th Scene | I Can Hear the Bells: Obviously I expected Ariana’s vocals to be amazing, but her acting is exceeding my expectations. Maddie is getting better and better as the show goes on. She did a great job with this song! Kristin unexpectedly made me laugh out loud when I realized she was playing piano and dancing in the background. LOVE. HER. 6th Scene: Rosie O’Donnell’s New York accent and humorous dialogue made the gym teacher character stand out. During the dance choreography, Maddie finally appeared loose and relaxed. 7th Scene | Ladies’ Choice: Derek didn’t blow me away with this song, but it wasn’t terrible. I think the main problem was I spent the entire time scratching my head and wondering why Link wasn’t singing. 8th Scene | It Takes Two : The excitement Maddie brought to Tracy’s first time on the Corny Collins Show put a smile to my face. Garrett did an ok job with his first solo, but something about his portrayal of Link isn’t sitting well with me. 9th Scene | Velma’s Revenge: UGH! Kristin is perfection! 10th scene | Welcome to the 60’s: This is one of my favorite Hairspray songs, and it did not disappoint. It was great to see Ricki Lake and Marissa Jaret Winokur make cameos. Their faces said it all; they were home! Tracy Turnblads, past and present, unite! 11th Scene | Run and Tell That: Penny and Seaweed’s first few interactions were adorable. Their chemistry is palpable! I hate to mention this, but was anyone else weirded out by the gym teacher’s comment about boys getting extra credit by taking a shower? Or did I interpret it in the wrong way? Ephraim Sykes has an amazing voice and the dance moves to match. Shahadi Wright Joseph is a ray of sunshine. Perfect casting for Seaweed and Little Inez! I loved the West Side Story vibes of the alleyway choreography. 12th Scene | Big, Blonde, and Beautiful: Let’s take a moment to appreciate Jennifer Hudson as a blonde. Stunning! And of course, her voice is mind blowing. No matter how talented they are, roles given to celebrities based on the value of their name can sometimes fall flat, but I want to give a shout-out to Kristin, Jennifer, and Martin. They are adding something special to this production. 13th Scene | Timeless To Me: Harvey’s voice still bothers me so this scene was all about Martin’s charm and humor. 14th Scene | Good Morning Baltimore Reprise & Without Love: Maddie’s vocals were amazing in this scene! Garrett is having good moments here and there as Link, but I’m still not loving the character as a whole, voice included. Seriously, Seaweed and Penny are stealing the show away from the main couple. They are so darn cute! Prudy Pingleton cracked me up rolling over the bed and screaming out the window. 15th Scene | I Know Where I’ve Been: The rain wasn’t supposed to be part of this scene, but it added so much drama. What a stirring performance by Jennifer! Brava! 16th scene | It’s Hairspray, Cooties, and You Can’t Stop the Beat: The Corny Collins Show scenes are over-the-top and a little bit cheesy. What more could you ask for? Once again, it’s obvious that Maddie struggles to sing and dance simultaneously, but I give her credit for doing this without experience. Brave soul! The final dance scene was great, and the bits of dialogue from Prudy and Mr. Spritzer were really funny. Also, Kristin’s crab crown and Martin’s flashy suit jacket deserve a nod. EXTRA | Come So Far (Got So Far To Go): The duet between Ariana Grande and Jennifer Hudson was a pleasant surprise. Their voices blended beautifully! It was also great to see the camaraderie between the other cast members as they danced and sang along. Final thoughts: I didn’t notice any major technical issues, just small ones. At one point, the camera work was shaky, and a few of the speaking parts were marred by low volume. It rained during Motormouth Maybelle’s second solo so it was performed indoors, but I didn’t think the scene was ruined at all. Anything can happen live! The cast was great overall. I especially enjoyed the performances of Ariana, Derek, Dove, Ephraim, Jennifer, Kristin, Maddie, Martin, and Shahadi. The only thing that really stood out negatively was inexperience. Some of the main cast members didn’t blend well with the ensemble during the dance choreography. I wouldn’t say I loved the entire performance, but there were some very special moments. I’m glad I gave it a chance! Subscribe to my blog to receive email notifications, and check out my other links listed below.